I started using Wish.com about two months ago after I learned a little about the company. It seems they had (at the time I encountered the info a few weeks ago) most of the over one billion dollars of the investment capital they had received remaining to be spent. More importantly they are apparently trying to eliminate fake goods from their site. Wish, as I understand it, supply goods direct from countries such as China at a heavily discounted price, the trade-off being that shipping is usually quite slow. It seems things that at least some items are oversold. As mentioned, I’ve purchased a few Micro SD cards through them, and it appears despite the listing information they have been too good to be true. Let me elaborate. First off I ordered a pair of 512GB Micro SD cards listed as Class 10 speed and at a price that appeared too good to be true, as indeed it was. The cards do seem to be fast enough to use in the 1080p camera I use on my bicycle, but for expanding the app space on a Kindle Fire (their original purpose) they are very slow. Ditto for file transfers in general. Filling up that 512GB would take a very long time. Compared to other Class 10 cards I have, the speed was quite shocking, but the size does appear to be correct so far, in as much as I’ve filled up a few GB of data with no issue, but not approached anywhere near the full capacity. So then I ordered two 256GB cards listed at 633x speed. I’d love to tell you how fast these are, but despite a delivery estimate of two weeks ago I’ve yet to receive them, so I guess I may be able to report on the Wish.com refund process if they don’t arrive soon. In the meantime I ordered and received another 512GB Micro SD card (this one apparently being U3 speed – awesome!!!). Again I rant this through a benchmark and it came out slower than the initial cards!!!! Real world file transfers are also very sluggish, but I have managed to use it for transferring some files between a laptop and Raspberry Pi. Virtually all the reviews of this card (and several others) show people generally reporting that they are happy. The devil is in the detail here though, as it appears 99% of these people are saying “the card arrives quickly but I’m yet to use it”, with a few saying “it works OK in my phone”. Only a very few people appear to have used actually the card. Of them only a few report it as slow. I wrote a review to join the couple of other reporting on the lack of advertised speed. 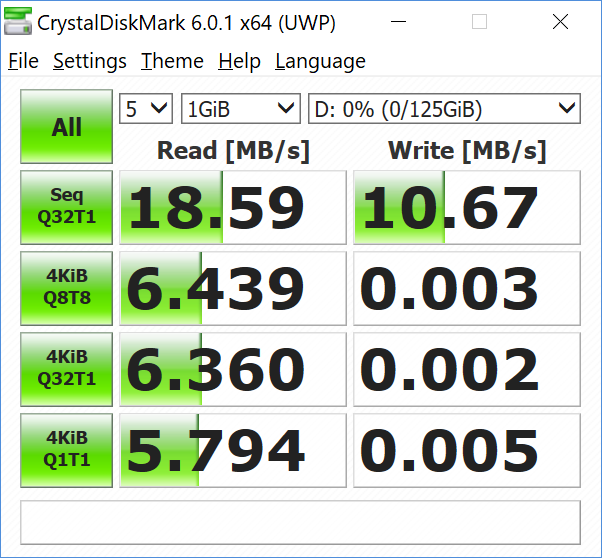 With this review I added a screenshot of my CrystalMark benchmark findings. It appears the test was accepted, but the image rejected. I guess that explains why every image in the reviews is of the physical card itself. Call me old fashioned, but I find this fishy. I’ll leave you to decide how you feel about this. I’m currently waiting for Wish.com to deliver a Toshiba Exceria 256GB Micro SD card. I already have an old 128GB version of this (benchmarked – it’s very fast) so I’ll be interested to see how this on compares if it ever arrives. Apparently it arrived in the UK today. I’ll report back in the comments. So, so far my experience has been mixed, to the point where if this final card is of similar quality to the three I’ve already received, I’ll go back to paying 3 times the price for merchandise from 7DayShop or Amazon instead. One final note, I’m also somewhat alarmed at some of the products listed at wish.com, notable flick knives, knives disguised as credit cards, knuckle dusters, hemp seeds, etc. In one stroke this makes me question the legitimacy of the site as a whole, especially with this stuff appearing on the main browse screen of the app. Some of their teeth whitening products look a bit scary too. So overall wish.com seems an interesting site. I’m sure I’ll order more from there in the future, but I’m going to be increasingly cautious about what I’m getting myself into. In a nutshell, at this point in time for me, it’s fair to say other retailers will still be seeing my business. Essentially, buyer beware. The site seems legitimate, but the product selection isn’t the best quality in my experience. Right on cue the “Toshiba” card arrived. I’ll let you decide how kosher it is. It’s interesting that the read speed is fractionally higher, but that write speed is criminally (and unusably) bad. Ultraviolet Video… why won’t it work properly. I’ve built up a (very) small collection of Ultraviolet videos, a grand total of 17 so far apparently. But I’ve never managed to watch any of them. Well I can download the videos and even stream them online, but the quality is less that perfect. I don’t just mean streaming via my embarrassment of a connection at home, but even through my 80+Mbps work connection. And by less than perfect I mean grainy and jerky video. Even on downloads. I used to blame my old Surface Pro 2, but secretly I knew that should have easily taken this in its stride. But I’ve just tried using my new XPS 15 laptop to watch something, and guess what – it’s no better, and this is a comparative beast of a machine. Sure it warned me that due to the scaling I have for the 4K screen, playback wouldn’t work full screen, but it isn’t working well enough in and scenario, windowed or full screen, downloaded or streamed. I linked the account to Flixster, but I doubt this is just a problem for them. So am I doing something wrong? I pretty much know what I’m doing with a computer so if I’m having trouble I’d be arrogant enough to assume I’m not the only one. For the moment, I’m at a loss on what to do next. So I’ll move on and worry about this some other time. It’s a shame as the concept offered so much. So I should be about due for another upgrade, right? Well the thing is apart from the small screen size I absolutely still love my Surface Pro 2. It’s powerful enough for most of the tasks I throw at it (with the exception of video rendering, which can never be fast enough) it’s lightweight, the pen is awesome, etc. Sure there are plenty of things that were improved in subsequent models, but overall I loved the package. The point is whilst a newer model would be great and provide incremental performance gains, day to day the SP2 is still a fine device. Apart from the fact that it started producing a lot of noise from the internal fan, and the replacement cost Microsoft quoted me was close to £600. So whilst the machine is capable enough, I find I can’t use it outside the house without fear of deafening everyone around me. Essentially the SP2 has been kept safely indoors for the last several months. I took to using my work supplied Dell laptop. A heavy clunky beast, strangely sluggish (for a mid-range machine) with less than stellar battery life. The additional weight meant that more often than not I’d just stick to using my phone and consuming media rather than creating anything. This was all a little frustrating. My main single part of my commute to work is a 55+ minute train journey between Colchester and London totalling a little shy of two hours where I could potentially be doing something useful… even if only occasionally. · Something that sits on my lap better than the kickstand of the Surface Pro machines. · More memory, at least 16Gb. If I’m going to use this thing for work I’d like to have that stuff running in a VM and well away from my main system. · More storage. 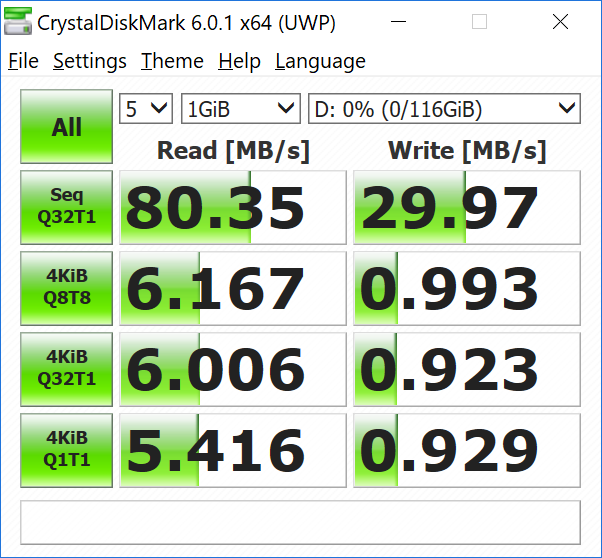 The 256Gb SSD of the Pro 2 was slightly constraining (you learn to live with these things), but again having the work VM would require a sizable chunk of storage for duplicate installations such as Office. · Bigger screen. The Pro 2 screen is beautiful to watch HD films on, but for using Visual Studio it’s quite restrictive. · Pen input would be nice. I used to use this extensively, although not so much in recent months. Having it there as an option is only a bonus though at it’s very useful when you do need it. · Touch screen. Once you start using a touch screen it can be really compelling for certain situations, and for mobile development it really gives an edge. · Decent trackpad. I guess I never notice this very often with the Pro 2 keyboard as I tend to either have it in tablet mode during travelling (due to that lapability issue) or connected to a mouse when sat at a desk. But on the occasions I do try to use it the touchpad experience on the Surface Pro 2 keyboard only just sufficies. · Something not too heavy. One of the reasons I upgraded from the Acer to the Surface was because the Acer was often being left at home due to its weight. There were other considerations too, but these were the main things on my list. After liking my Surface Pro 2 so much and with the noted wish list, the natural contender was a Surface Book. I’ve been looking at these beautiful machines since they were announced and had they arrived on these shores around the same time as the US release I’d probably have snapped one up almost instantly (after all I got my Pro 2 on launch day). But I’ve got three children now and that price was just too much. Looking at the 512Gb model it had everything I wanted… but at what cost. As for the model with 1Tb of storage…. · Large (15 inch) 4K touchscreen. · Up to 32Gb memory, double the maximum currently available on the Surface Book. · 1Tb storage with aforementioned 32Gb memory was cheaper than the 512Gb/16Mb Surface Book. · Faster than a Surface Book. · Worse battery life than the Surface Book. · Windows install contains a little Dell Crapware (I’m looking at you McAfee) as opposed to the ‘Signature’ installation of a Surface Book. This was going to be a hard choice… or at least I thought so. 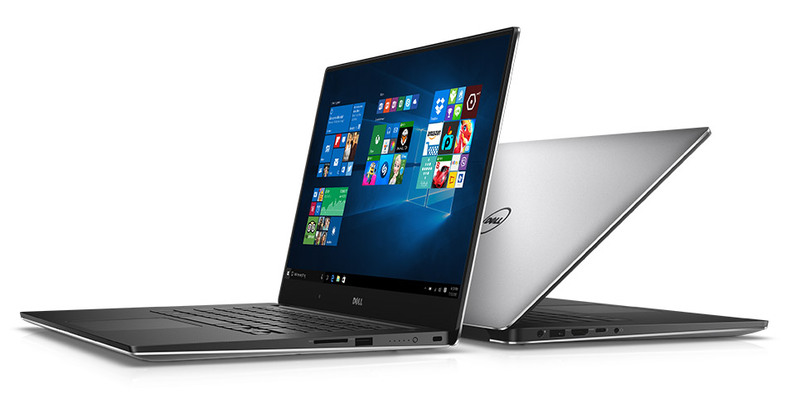 When it came down to it the compromises of the XPS 15 seemed more than acceptable against the advantages, and the machine looked to be a little more future proof too with the additional RAM and storage I could get for the cheaper price. So I ordered the Dell. Despite the order status stating the machine wouldn’t arrive for 4 weeks it actually arrived in a little over 2 weeks, not the instant gratification you hope for but not too shoddy either. The machine actually arrived a couple of weeks ago, but I’ve been on holiday much of the time since then so I’ve only had limited time with it so far. The first thing I did was upgrade the OS to Windows 10 Pro (fortunately I had a spare key) and force installed the anniversary update (1607). I’ve not reset the machine down to a clean state now, I figured I’d see how I get on with McAfee and the Dell software installed for a while (can I last the first year) and performance seems to be good, but I can’t help wondering how much better it could be if I did this. Start-up times in particular are acceptable, buy not as good as I’d imagined. Also there’s a strange bug where I need to restart the device after initial power on due to the ShellExperienceHost service becoming unstable. I’ve set up a VM for work and assigned it 16Gb of memory and 4 of the total 8 processor cores, and whilst I’m yet to push it, this also seems very responsive and should be faster than the work supplied laptop without bringing the rest of the system to its knees. That 4K screen is lovely, but frankly after the WOW moment on seeing the Surface Pro 2 screen all those years ago, it’s clearly better but incrementally so. I’ve not done anything to push it yet, with the exception of the 4K videos shot on my Lumia 950 XL, and these really do look impressive, but that’s expected isn’t it? Perhaps OLED will be my next WOW! Moment? One bad side is that the screen is such a high resolution that some Desktop applications don’t scale properly. Surprisingly Outlook 2016 (yes, the very latest patched version) has the occasional dialog box that appears corrupt. If Microsoft can’t get its house in order it’s no wonder third party apps also fail in this situation. The laptop is heavier than I’d like, but I’ve got used to this to some extent from carting around my work supplied laptop. Either way it’s not ideal, but at the moment I can live with it. The keyboard, despite reviews and my pre-purchase concerns, seems OK. It’s not the best I’ve ever used, but it’s nearer the top than the bottom. I’m getting on fine with it and as I get more used to it it naturally becomes more comfortable. But then that would be the case with all but the worst keyboards out there. Surprisingly, even in Desktop mode I used the touch on the Surface more than I’m currently doing with the XPS. I suspect there’s something wired in my brain that says Laptop = no touch, despite the fact I owned a convertible (that was closer to a laptop) back in the Vista days. Partly that may be down to the touchpad though. I’ve never used an Apple touchpad which are supposed to be the gold standard, but this is certainly the best I’ve used, and the ability to scroll using two fingers has meant that I don’t need to reach out to the screen as often as I used to. However, I still do tap the screen on occasion and would definitely choose to have touch available rather than not, that’s no contest. One other thing I noticed quite quickly is that the matte silver back of the lid seemed to start getting scuffed almost from the first time I put the laptop into my bag. I quickly purchased a sleeve to keep the machine protected during transit so that was £30 I hadn’t counted on, but it does “complete the package” and looks quite smart. So that’s my initial impressions of the new kit. Not perfect (weight, battery life) but I’m very pleased so far. I guess time will tell how I feel going forward. Overall though, No regrets. I think I made a good decision for my needs. I’ve not considered getting a 4K monitor. My graphics card isn’t powerful enough to drive one on my desktop PC. I’ve got a lovely, relatively new (1 year-ish old) 1080p monitor, which I’m very happy with. But am I missing a trick. Should I get another 1080p monitor, as I’ve been planning to for a while, or just get a 4K monitor and future proof a little more?